I too built a project in a PE 0.5 cu ft speaker cabinet. I used an RS180 woofer with a Seas 27TDFC tweeter. I can't take credit for the design though. Jay Kim designed the project including the crossover. I love the sound. Jay did an incredible job of voicing the speaker. My only complaint is the bass isn't quite deep enough for my liking. The bass rolls off rapidly below 50hz. To compensate I boost the bass at 30hz about 6dB. Your project uses really excellent (and expensive) drivers. I wonder how much improved the bass is on your project? You've got me thinking to perhaps putting your design into my 0.5 cu ft box! A very handsome project indeed! I presume WAF or SOAF is high as well? I added another response test to the photobucket link which I should have put there originally. It shows the full extension of the bottom end with nearfield mic and vent mesurements. 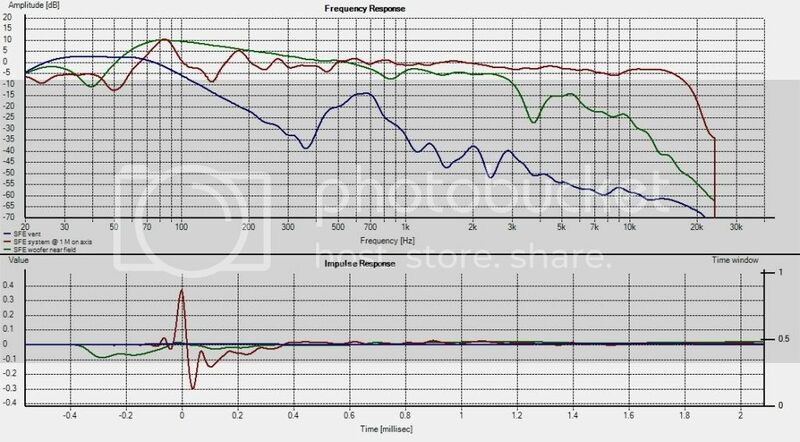 The woofer starts rolling off at 70 hz, and is 5 dB down at 60 hz, but the vent picks up only about 7 dB down and doesn't roll off until 30 hz. Those SS bass/mids are known for their awesome bass. The complex schematic you showed is what I avoided. To me, a simple 1st order elect. xo with great drivers is extremely musical. Some will criticize it, but no xo is perfect. They're all compromises. I presume WAF or SOAF is high as well? Yep, the wife is unreasonably sensitive when it comes to clutter in the great room. But she's OK with the .5cf curved cabinets on the stands. But I fear anything bigger would be testing her. She doesn't like SW's either. The aluminum RS180 woofers have a twin peak resonance around 7-8K IIRC. That needs to be adressed in the XO thereby making it a bit more complex. They are crossed over quite low, around 1.6K. But I agree the simpler the XO the better when possible. Since I am ham strung with a .5CF box there is no sense in "up-grading" unless I know for sure I can get deeper bass than what I have now. Your tweeter circuit looks like it was no picnic either. Regarding the bass response, I suspect my relatively little bass/mid < 6" dia. is doing about the same as your 7 inch eq'd like you have it. It's plenty for me. As they say: YMMV. Before re-doing the whole thing, try raising the bass tuning to 57-60 Hz. Assuming the vent is 2", make it about 2.5" long. I think you'll find that brings back some much-desired bass oomph. This is a refreshingly different crossover design. I'm very curious to hear it. I have a pair of the the SS 9700, but I only have the 8530K00 (not the K01 model you have). Do you think it's close enough to give it a shot? Yes, I think that would work as well. That woofer/mid has also been praised alot for its bass output. Would the advantages of keeping the XO super-simple be outweighed by the interference issues? 2800Hz = 4.84 inches. So at that frequency, half wavelength cancelation will occur if the paths to the mic (or our ears) differ by about 2.4 inches. Wait, let's do this math from the other direction. The SS 15W/8530 K01 is 5.83" in dia. The SS D2905/9700 is 4.09" in dia. Plus the gap between the tweet and woofer... That gives us approx. 5.35" center to center. Let's also keep in mind the fact that the woofer's acoustic center is approx 20 mm (0.79") deeper in the box. Crunch some trigonometry with all of that and I would expect to see the that the two drivers will be out of phase (and will produce deep nulls) at particular locations & particular frequencies in the vertical direction. 39 inches from the tweeter and 14" above the tweeter height you might see a null at 2710 Hz. 39 inches from the tweeter and 19" above the tweeter height you might see a null at 2291 Hz and another smaller one at 6873 Hz. 39 inches from the tweeter and 24" above the tweeter height you might see a null at 2027 Hz and another smaller one at 6082 Hz. So again, would the advantages of keeping the XO super-simple be outweighed by the interference issues created by the nearly 4 octave overlap? Have you taken any measurements in the vertical direction to see if the overlap is creating "path-length" cancelation problems? It might not be an issue at all. Cool speaker. Thanks for sharing it with us. I'll have to say it works nicely!! I wipped one up with an Audax HM130Z0 and an Usher 9500...very smooth. 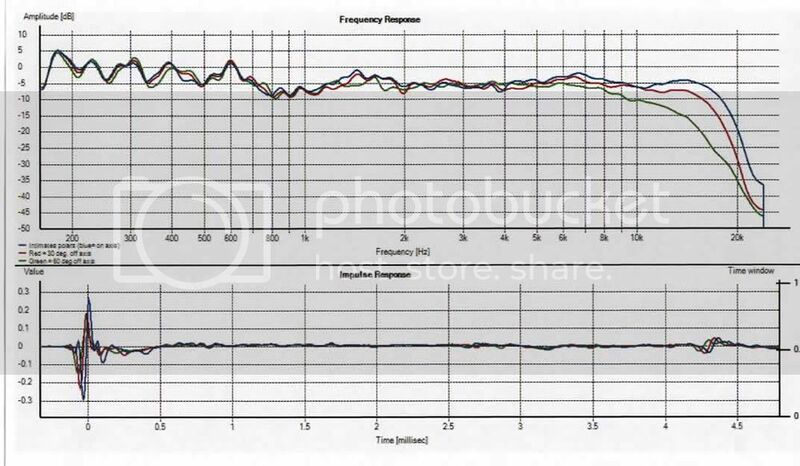 I have L1 at 0.15mH, L2 at 4.7mH, and R1 at 5Ohms. To answer your first question, HI software zeros the db level of each measurement so that overlap you see may not be as real as it appears. The bottom line is the red trace that show any evidence of an additive effect in the overlap region and that's all that matters to me. There's also a vent resonance in the 600-700 hz region, but it also has no impact at distant on-axis measurements. Re the second question, I looked back thru all the measurements I took, but couldn't find any verticals - probably because they were of no interest to me. In fact they still aren't. I listen to them seated in the sweet spot in my rocking chair. The speakers are on stands I carefully chose the height of (26") to put the tweets about at ear level and that's it. You may want to visit a large thread about series vs parallel xo's over at DIYaudio multi-way speakers forum. Lots of theory there. A couple of guys who's opinions I highly respect participated from time to time. You may want to read more of their stuff. John Kreskovsky (aka johnK, and Dave Smith (aka speakerdave). They are about as good as you're going to get in these DIY forums. Thanks Paul, I'll give that a try. The port is 1.875" I.D. close to enough to 2". Which xo did you use? How was the sound? I fear you're dippng into bad territory. I did the AR capacitorless design, sounds good!